IN THE BEGINNING, Aaron Martin and Kory Westerhold, long-time friends working as high-ranking designers at Yahoo and Apple, had the idea to re-approach the digital reading experience after a night of lamenting their shared frustrations with long texts on tiny screens. They wanted to take on the concept from an entirely modern perspective. They needed to make it relevant, meaningful, and of the times without adding ”just another reading app” to the densely cluttered marketplace already in place. 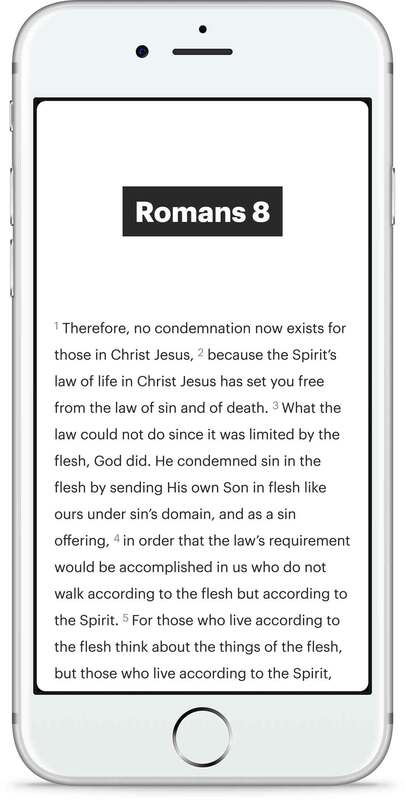 Their solution, the NeuBible app, is now one of the most lauded reading apps on the market, and they did it with one of the most iconic long-form texts there is. The Bible has always been the standard for mastery of communication in new media, evident in the evolution of writing from calligraphic scrolls, to illuminate manuscripts, to Gutenberg’s moveable type and his 42-line Bible. 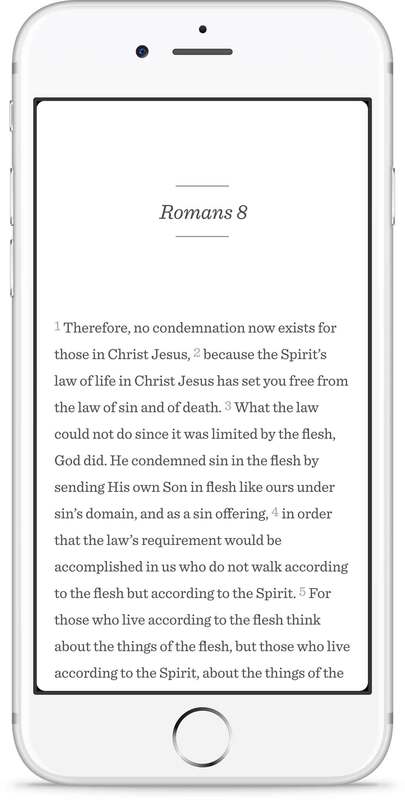 So, it is perfectly logical that the text used to truly test this newest medium of communication—the digital frontier—would be the Bible. With NeuBible, readers can customize the experience with a choice of new fonts. 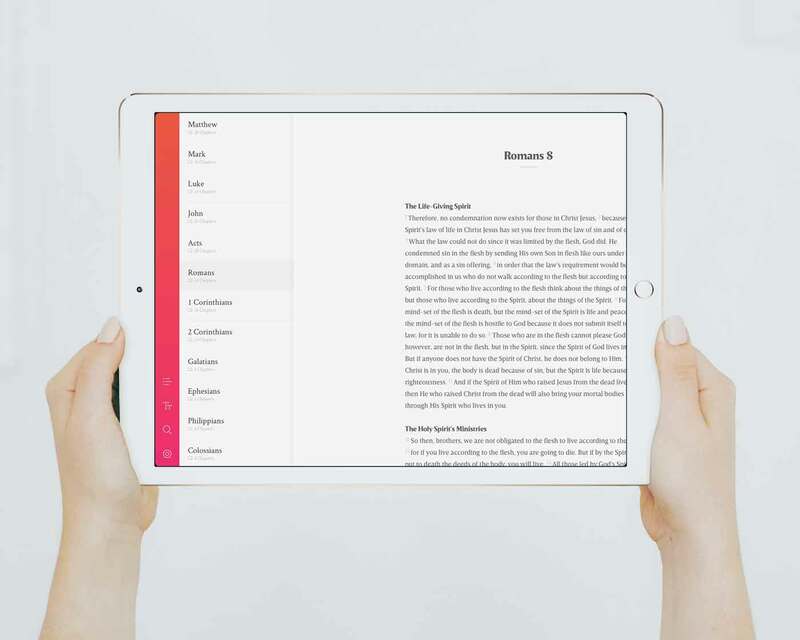 NEUBIBLE’S APPROACH to delivering such a purposeful and crafted reading experience focuses on stripping away the cliché bells and whistles of existing reading apps and focusing on bringing ease and enjoyability to the reader in that moment when human meets machine. This means focusing on typography. The app delivers the text through a highly curated selection of four distinct typefaces, each chosen for clarity and color. Though the real secret sauce behind the app’s crafted experience is the fact all of the types were designed in the last 10 years: Breve Text from DSType, Graphik by Christian Schwartz of Commercial Type, Sentinel by H&Co, and Texta from Latinotype. “These typefaces were born to operate in this medium,” Martin states. “Each typeface present in the app has a pedigree for this experience.” Whittling down a list of typefaces to just four is a challenge for any designer, but the final set of expert choices brings an understated and balanced variety sure to pleasantly surprise any reader. The guiding light for type selection was ensuring that every interaction with the app is perceived as unquestionably natural, and incredibly personal. “It used to be a fun thing to get a bible that would fit you best from walls of design choices on offer. There was always so much choice in the bible store. 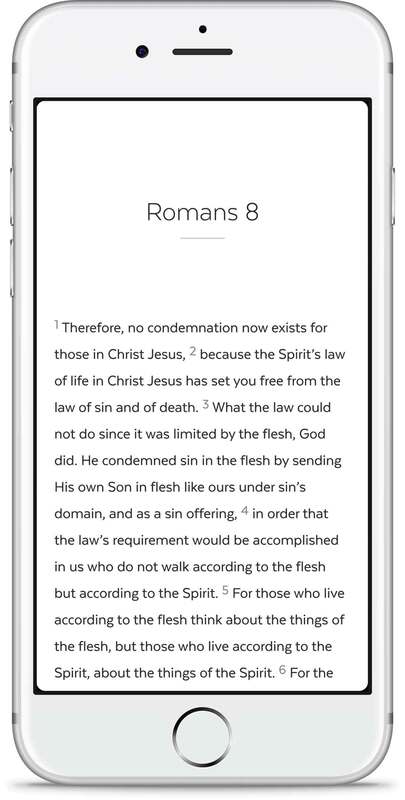 We wanted to bring that aspect of personal connection back into the conversation.” NeuBible delivers on this through the use of types that effortlessly amount to a new expression of the Bible worthy of its time. The Bible has emerged from history as the litmus test for any new communication technology. It’s the ultimate typographic gauntlet—the standard to which we can measure all facets of typography from the typesetter, to the medium, to the type itself. NeuBible has championed these challenges while setting a new standard for communication in a digital age. It is proof that reading long texts on tiny screens can be a beautiful and possibly even transcendent experience. AARON MARTIN will tell you that the creation story of NeuBible is one of being in the “right place at the right time.” Martin and co-founder Kory Westerhold, friends working as high-ranking designers at Yahoo and Apple respectively, had the idea to create the app after a night of lamenting their shared frustrations with reading long texts on tiny screens. 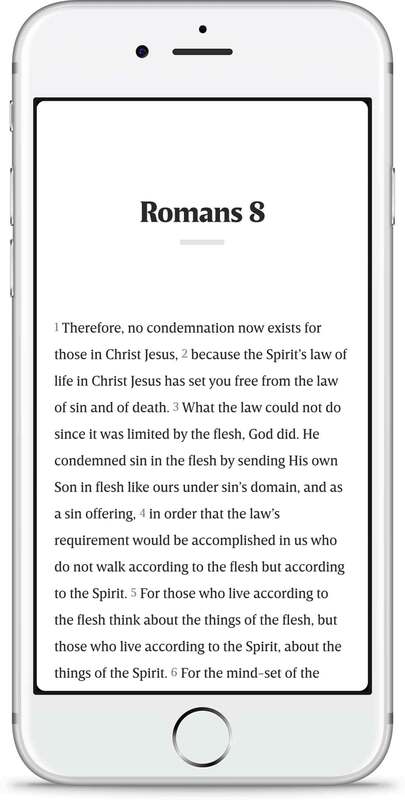 Being technically able and entrepreneurial in spirit, they sensed an opportunity to create, as Martin puts it, “the most thoughtfully designed reading experience.” This epiphany resulted in one of the most lauded reading apps on the market, and a new expression of one of the most iconic long-form texts there is: The Bible. It grew out of the formalization of writing in clay tablets, progressed to inks on fibrous papers, and was advanced by the refinement of the Latin letter in illuminated manuscripts produced by monks and scribes. The culmination of this lineage came with movable type and Gutenberg’s 42-Line Bible in 1454. Recently though, it seems history has added another stone: the digital screen. No tags with this post.